Designing a tile backsplash can feel overwhelming, especially since it's the last piece of any kitchen design. Taking cues from decisions you've already made can help narrow down the choices. While a tile backsplash was once a functional part of the kitchen design, protecting walls from splatters and stains, it has evolved to become an important part of the kitchen's aesthetics. 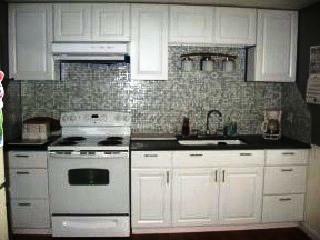 A backsplash can complete the design, add decoration, color or pattern to a space. Any material, shape, size, color or texture is suitable depending on your tastes, budget and style. 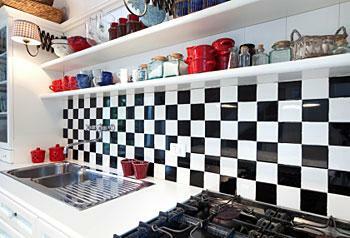 The first thing to keep in mind when designing a tile backsplash is the amount of space. Most backsplash areas between the counter and the underside of the cabinets measure 18-inches. If a 4-inch backsplash of counter material is used, this will need to be subtracted from the space designated for pattern. Many backsplashes will also have an area behind the cooktop or sink suitable for more intricate designs. A hood above a range must be 6-inches wider than the range to meet code, making the space behind the cooktop perfect for framing. 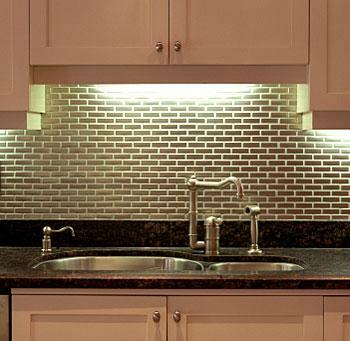 The fact that any material can be used in a backsplash can be extremely overwhelming for some homeowners. How will you narrow it down? The answer is simple: by following certain design criteria and guidelines. Curious as to what color will work best in your kitchen? Look no further than your countertop for the answer. Granite, Silestone, Corian or Formica, all kitchen counters come with a built in color palette. Shading, flecks of color, veins or even a solid color can give you a clue as to the color of your backsplash. One of the most popular kitchen counter materials today is Uba Tuba granite. While at first glance, this stone is a dark, nearly black green color, closer inspection actually yield several other colors. Turquoise, cream, gold and several shades of green are contained in its surface. Use any of these colors, or a combination as your palette. Have a solid colored counter? Take the tone of the color as the starting point. Every color has a tone that leans toward cool or warm shades. Stick to colors that complement the tone of the counter to find the right ones. Once again, your countertop should be the starting point for determining the style of your backsplash. Tightly patterned granites, quartz composite stones and solid colored counters can handle a busy backsplash full of life and pattern. Granites and marbles with heavy veins and swirls of color will compete with a busy backsplash, so in that case keep the style simple instead. From here, look to your cabinets; are they traditional, rustic or modern in style? Take your cues from what's already in the space to make the right decision. The kitchen backsplash is typically not more than 40 square feet of material for the average kitchen, and is frequently smaller. So don't be afraid to splurge in this one area if you find something you love. Are you into green building and recycled materials? Look for recycled glass mosaics and tiles of all shapes and sizes. Is this a beach house or do you love the outdoors? Consider using river rocks as either a border or field of the backsplash. Do you love art? Handmade tiles with intricate, handpainted detail can complement paintings and details throughout your home. Any of these materials can be purchased in a wide array of colors, sizes and styles to complement your space. The biggest purpose of a backsplash is to make you happy with the space, so go ahead and choose a tile you love. Once you've selected a color, style and material for your backsplash, it's time to design. Most tile showrooms will have samples available for loan or purchase. Bring a few home with you to see them in the space. Take grout joints into consideration, and how many tiles will fit in a space before being cut. Feel free to combine materials for richer design, such as glass mosaics just behind your range, while simple subway tiles line your counters. Designing a tile backsplash can take time. It's important to remember that your kitchen is complete and usable without one. Don't rush or feel pressured by a builder to put in a tile you aren't sure of. It is not uncommon for backsplashes to be installed up to a year after the cabinets and counter to give the homeowner time to decide. Consider all the design elements of the kitchen, and select a tile that speaks to you. In the end, you'll have produced a backsplash design that suits you and your kitchen perfectly.